First of all, I need to assure my readers that I have absolutely no connection with the author of this book or his publisher. I received no incentives to write this. I purchased the book myself, and have been using it daily for several months. This review is based solely on my admiration for an exceptional recovery resource that doesn’t get enough air time around the rooms. I begin this review with trepidation because it is normally my policy not to do book reviews or promotional posts. I had to adopt that position after years of requests to read books, infographics and do reviews of websites, some of which were great, some of no interest and some of which were even toxic. Nonetheless, I’m writing this one — with full knowledge that it will probably engender another s—storm of requests (which will, let me say in advance, be refused). A year or so ago, I started looking for recovery resources that would be suitable for people who have a problem with the “God Thing” in AA, NA and most of the other 12-step fellowships. As we all know, this is an issue for some, newcomers in particular. 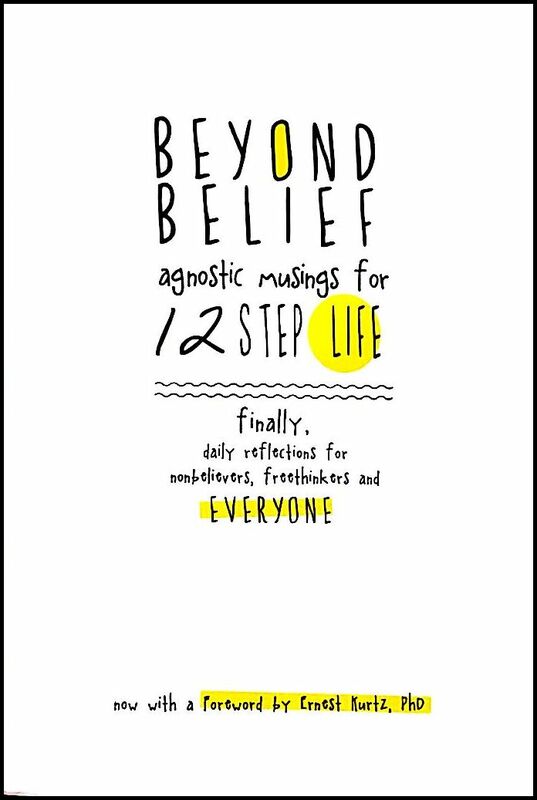 While searching, I stumbled across “Joe C” and Beyond Belief — agnostic musings for 12-step life, his book of daily readings for folks in recovery. After using it for the past eight months, I have come to the conclusion that it is the most valuable recovery resource I’ve used in more than a quarter of a century in 12-step recovery, excluding the basic texts of the individual fellowships, of course. I learn something from it every morning, and I would be proud to have written it myself. Unfortunately, I’m just not. . .that. . .good. Don’t let the title fool you. This isn’t a trash-the-believers book. It’s respectful and inclusive: more a secular examination of the various addictions and programs than agnostic in the sense most people think of it. No believer of any kind need be put off, and it would be a crying shame if any were because this book is a treasure chest of down-to-earth, triple-distilled recovery of the best kind. First time Fourth Steppers are cautioned that this list is no magic pill; it is a step in the right direction to honest self-appraisal. Many of us do Step Four more than once just as some businesses do a complete inventory every year or two. Each new inventory isn’t an admission of failure of the previous stocktaking. Rather, it is a new balance sheet on a new day to quantify progress and circumstances. Some inventories look at the good and the bad: shameful acts vs. great accomplishments, healthy expressions of fear and anger vs. unhealthy expressions of fear and anger and our histories of deception and avoidance vs. examples of bravery and honesty. Mismanaged feelings are addiction triggers. Step Four uncovers the emotional triggers that set off the freeze, fight and flight reflexes. [Emphasis mine] Like a blueprint, Step Four shows us how we’re wired, opening the door to change. Like I said, I sure wish I’d written that! Please, suspend your prejudices about the word “agnostic” (which, after all, only means “one who doesn’t know”), and get a copy of Beyond Belief. I promise you that it will be one of the best recovery purchases you’ve ever made. It will be part of my daily practice from now until I move on to find the definitive answers, and I’ll bet it will be for you, too. This entry was posted in 12-Step Programs, addiction, alcoholism, Meditation, Process Addictions, recovery and tagged 12 Steps, aa, alcohol, alcoholics anonymous, buddhism, NA, reality, recovery, spirituality, staying sober, Substance abuse on September 1, 2016 by Bill. One of the fellowships that I attend is focused, in the early stages, on the process of overcoming obsessions. Obsession of one kind or another is a big component of most addictions, but some more than others. The interesting thing about obsession is that it is a vice best practiced while alone. Our brains go ’round and ’round, and we are unable to shake the undesirable thought pattern no matter how hard we try. Our minds keep coming back to it, him, her, that, those, and it can seem as though ridding ourselves of the thoughts is like trying to push toothpaste back into the tube. 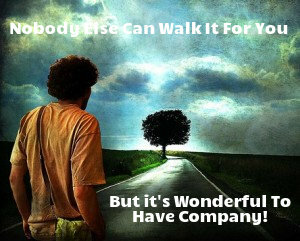 But put us in the presence of another human being with whom we have to interact, and things are different. This entry was posted in 12-Step Programs, addiction, addiction treatment, alcohol abuse, meetings, recovery, relationships and tagged 12-step fellowships, aa, fellowship, NA, support on July 26, 2015 by Bill. Let me say at the outset that I am a firm believer in AA, NA and the other 12-step fellowships (just in case you hadn’t noticed). They saved my life, the life of my wife, and that of my best friend, his wife, my son-in-law and many of the other people who are most important to me. One of the other fellowships is helping me work on some other issues that have plagued me since childhood. For me, it works. It worried me early on, and continues to worry me two and a half decades later, how some people in the rooms seem afraid to allow their knowledge of alcoholism to progress beyond the middle of the last century. It’s as though if they admit that the founders of AA didn’t know every possible thing there was to know, that it somehow calls the entire recovery issue into question. Now I’ve gotta tell you: if I had a deadly disease (which I do), and if my continued good health and well-being were contingent upon my knowing as much about it as I could find out (which I believe they are), and if I were constantly giving guidance to people with less experience who suffer from the same disease (which I am), I would feel morally obliged (which I do) to find out every single thing that I thought might be useful in educating people about our little problem. There is no question but that the 12-step model works for a lot of people. Not all, for whatever reasons, but a bunch. I know way too many people who have been helped by it to doubt the point. But let’s get to that word “believers” for a moment. That’s what I get from a lot of folks in the rooms: that they are True Believers, and that anyone who suggests that the first 164 pages of the Big Book aren’t the be-all and end-all of knowledge about recovery should be treated about the same as an evolutionist at a camp meeting. As stated above, I’m a believer. But I no more ignore the 80 years that have passed since the first edition of Alcoholics Anonymous than I am likely to ignore the little nuances that the medical community have developed since Sir Alexander Fleming’s discovery of penicillin. I have a theory about the folks I’m discussing — the same one I have about creationists. They’re afraid to learn anything new, because then they might have to get out of their rut and accept a new world view. I gotta tell you, I hope none of those folks ever need a liver transplant. We’ll just have to give ‘em a shot of penicillin and leave them to recover on their own. This entry was posted in 12-Step Programs, addiction education, alcoholism, recovery and tagged aa, addiction science, disease concept, NA, psychology on June 18, 2015 by Bill. Eighty years ago today, a proctologist in Akron, Ohio, took his last drink of booze. As a result of his having gotten sober with the help of another drunk, a businessman from New York, Alcoholics Anonymous was born. More here. It would be interesting to know how many people owe their lives and the sanity of family members to that happy coincidence, via the rooms of AA and its sister organization Alanon. We will, of course, never know. We can surmise that the figure is in the millions, but there is no real way to tell. There’s a bunch, though. I know a few myself. Happy Birthday, AA! And thanks, from the bottom of my heart. This entry was posted in 12-Step Programs, alcoholism, meetings, recovery and tagged 12-step Programs, aa, alcoholics anonymous, bill wilson, Dr Bob Smith, NA on June 10, 2015 by Bill.